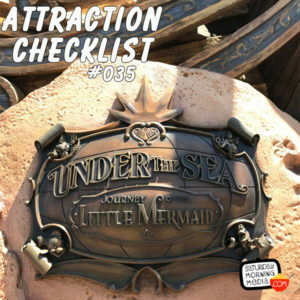 http://www.attractionchecklist.com – Let’s head to Magic Kingdom and visit Ariel on Under the Sea – Journey of the Little Mermaid. John B. deHaas is along for the ride and we discuss our thoughts on this attraction after we ride. Recorded on October 27, 2016. Before we begin flipping our fins, here are five fast facts about Under the Seas – Journey of the Little Mermaid at Magic Kingdom. 1. Under the Sea – Journey of The Little Mermaid officially opened at Magic Kingdom on December 6, 2012. It was built on the site of the former 20,000 Leagues Under the Sea attraction. Before that classic ride was removed, imagineers saved several jars of water from the 20,000 Leagues lagoon. In a special ceremony with The Little Mermaid attraction opened, the water they’d save was aded back into the new water features as a nod to the original ride at that location. 2. With a ride length of 5 1/2 minutes, Under the Sea – Journey of the Little Mermaid is one of the longer rides in Fantasyland. It also boasts an interactive queue area where guests can help crabs sort out Ariel’s thingamabobs while they wait to ride the attraction. 3. Original Little Mermaid stars Jodi Benson and Pat Carrol lend their voices to Ariel and Ursula on the attraction while Phillip Lawrence provides the voice of Sebastion and Chris Edgerly voices Scuttle. 4. The attraction reportedly boasts over 180 characters! Most of them, around 120 characters, are featured in the Under the Sea sequence of the ride. 5. Finally, if you’re a fan of finding hidden Mickeys in the Disney parks, this attraction boasts one of the most unique Hidden Mickeys ever. Imagineers constructed the rocks outside the queue for the attraction in such a way that the sun creates a Hidden Mickey only once a year at noon on November 18th, Mickey Mouse’s Birthday! Let’s hop aboard our clamshell to a pay a visit to Ariel and friends. Along for the ride is John B. deHaas and he and I will discuss our thoughts on this attraction after the ride audio. This is a binaural recording so if you have headphones put them on now as we experience, Magic Kingdom’s Under the Sea – The Journey of the Little Mermaid.